Northwest native and popular recycle artist Kim Groff-Harrington has been using tin, bottlecaps and "stuff", wired together in her unique way for the past 10 years. Her work can be seen around the NW and around the United States. She took the Red Bull Challenge in 2006 and was honored to have her piece as one of the thirty-five pieces selected from eighty-six entries and displayed at the Red Bull Art of the Can Exhibit at the Weisman Art Museum in Minnesota. 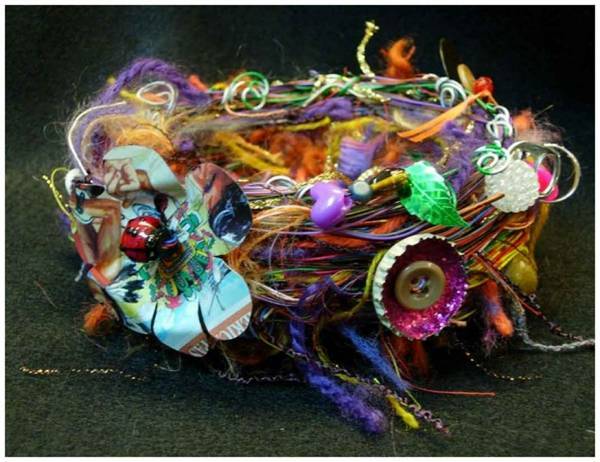 In summer of 2008 Kim was flown by the prestigious South Bridgehampton Children's Museum in New York to participate in their recycled art event. unwanted, discarded items and bringing new life to them. and my unique way of wiring materials together." Copyright 2007-2010. Kim Groff-Harrington. All rights reserved.